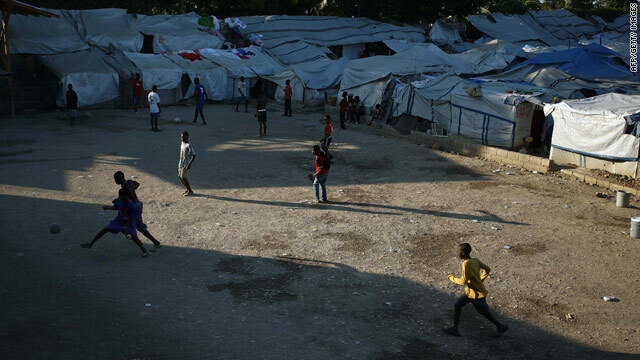 Kids play near their tent city in January 2011 in Port-au-Prince, Haiti. Haitians are marking the one year anniversary of the 7.0 earthquake that devastated their country today. While thousands of aid organizations and non-profit groups answered the call for help and the international community pledged billions of dollars to the recovery effort, progress on a large scale has been hard to come by in Haiti. That's not to say that work hasn't been taking place. Signs of improvement dot the landscape. But 1.2 million people still make their homes in tent cities. Rubble and damaged buildings are seen at every turn. Those images have some people wondering what is happening with the money that they donated to the cause. It would be absolutely wonderful is all the money raised for Haitian relief actually went to Haiti. All of the big charities hold back great portions of the money raised for "future disasters". What is happening toi all that money? Katrina- money held back. Tsunamis- money held back. Haiti-money held back. Everyone of those big fundraising organizations hold money back-for what? Where is that money going? If 300 million is raised for Haiti, 300 million should go to Haiti!!! They might recover if the American Red Cross and The United Way didn't hold back funds. Look it up; it exists and it's disgraceful!!! banasy I full out think you are right. They were given enough money to build that country over several times, yet they are still living in tents provided by us and looking at the US to put them into homes where there were once nothing more than shanties. I guess my question is, what have they done to help themselves??? 100% correct!! That money could better be used right here in the USA! It would have almost been better to do nothing at all sometimes.. Very sad, indeed. Dayna your right to. This is horrbel. The will for change has to come from the Country's people and not from external sources... just like in Afgahnastan...if the people are just too complaicent to care about fixing their country and making things better because it's easier to ask for handouts, wine and complain about outsdie aide then no amount of money or help will change things and outside sources are just fighting a loosing battle and throwing money down the drain. Haiti needs to recover and heal before they can begin to rebuild. As soon as they have the thousands and thousands of injured re habbed and ready to use their new arms and legs is when they will spring into action. I would say there would have to be a lot of strategic planning prior to rebuilding their world that takes a lot of time and effort. Baby steps and patience for now. With the heart and stamina the Haitians have shown, I see big things to come for Haiti, God willing. The Haitian people need to purge their so called leadership ranks! As someone been to Haiti 4 times since the earthquake can tell you the only people doing anything in Haiti is the little people struggling for every penny they can get hold off. A Haiti house can be built and but a family in it in 3 days. I know I've been there. Thank God for the handy work I have seen by Samaritan Purse. I have been in contact with over 200 villages and know the needs. This is very sad. I'm doing my 4-H speech on haiti and I have not been plesed by what I have foned. The money shouls go to the 1.6 million homeless. Even Obama is not happy about this money loss thing. This needs to stop. And if any one tells me to shut up, I don't even care. Maybe I would have 2 weeks ago, but after seeing this and your coments, I know what nots to be done. Oh and Mearder you need to speek when your told to. And all this is coming from an 11 year old. Jesus came to seek and save what was lost. At the end of all things waits a Judge, and He will judge on what you did and didn't do. You know what else? The measure you use toward another will be used against you, shaken and pressed down. So how you dish, expect it to come back flowing over. Learn compassion. Actually, I go to MSNBC for one. FOX News has at least two opinions, while MSNBC CNN are in the back pcoket of the Obama Administration. Since they like to create this FACADE about Mr Obama, they realize that this fake reality will only last if the Liberal Media helps prolong it! !